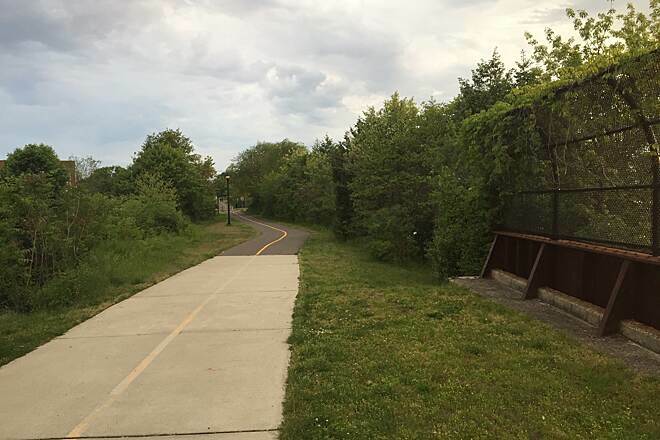 This is a true community trail: four small cities are tied together by this corridor, each maintaining their short section and calling it a different name. 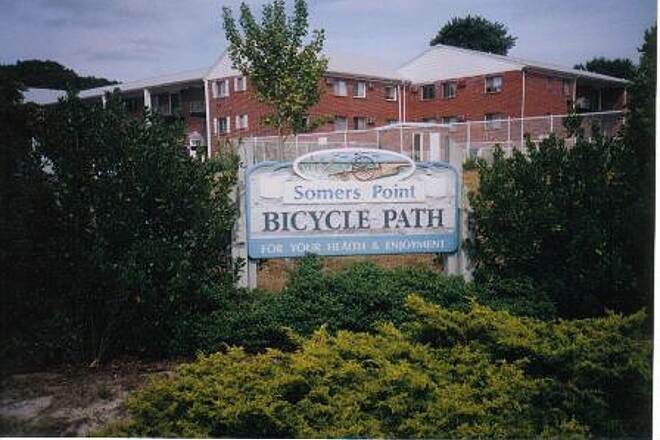 Starting in Somers Point, a few blocks from the Atlantic Ocean, a large, bright sign welcomes you to the Somers Point Bike Path. The trail then heads north through Linwood, Northfield and Pleasantville. Atlantic City is about a dozen miles northeast, and the area leans toward an urban setting. Frequent street crossings require caution. 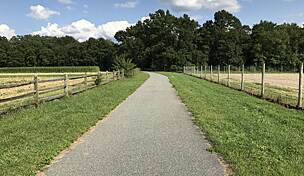 Most of the trail travels through residential neighborhoods and the schools, parks and playing fields in between. Students use the path as a safe walking route between home and school. Residents of the trail's neighborhoods frequently walk it for exercise or take their babies for a ride along in strollers. Lightly traveled neighborhood roads—and busier Shore Road to the east—parallel much of the bike path, so a meal is never far away. A few short wooded sections provide a change of pace from the residential neighborhoods that make up most of the path's viewscape. 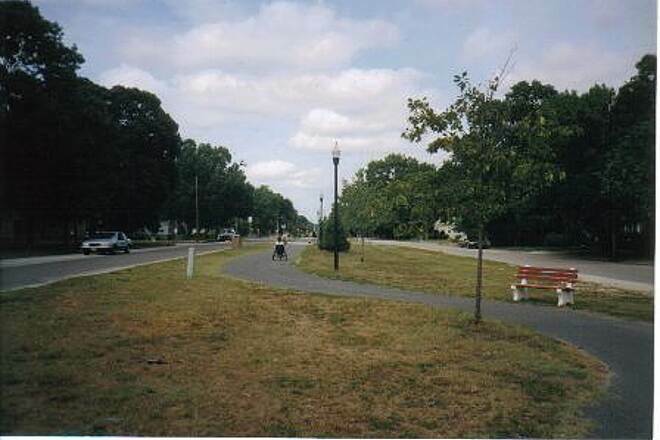 From the municipal building in Somers Point, at the intersection of West New Jersey Avenue and 1st Street, the bike path heads north, parallel to 1st Street and passing areas of primarily commercial properties. Beyond Maryland Avenue the area on each side of the bike path is primarily residential. 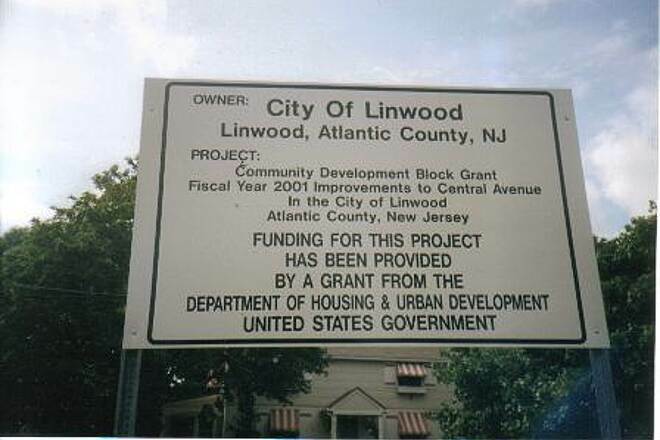 Just after passing over Ocean Avenue, the bike path enters Linwood (and is occasionally called the Linwood Bike Path), which consists primarily of residential neighborhoods. The bike path takes the center of a wide median that divides Wabash Avenue; the eastern side is one way north and the western side is one way south. Enter Pleasantville, the most urban of the communities, after passing over West Ridgewood Avenue. 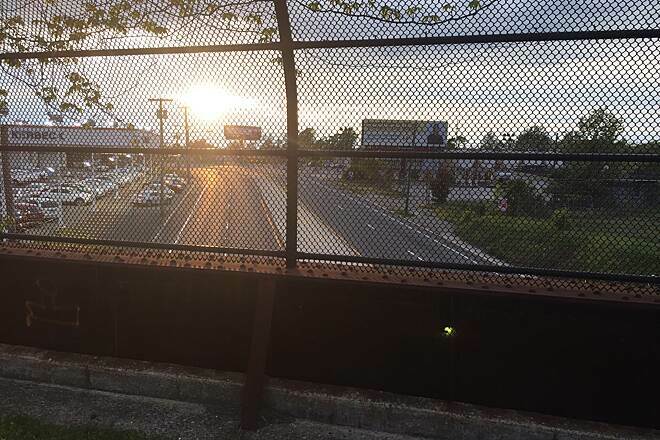 The trail continues to West Decatur Avenue and extends across the inactive railroad bridge that crosses the Black Horse Pike. 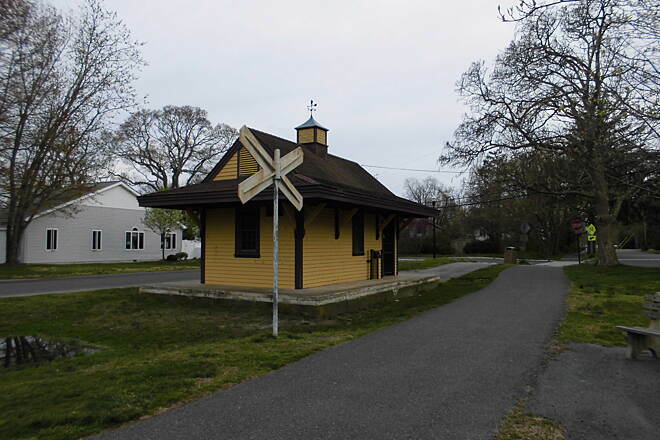 After crossing the Black Horse Pike on the railroad bridge, the trail extends another 0.75 miles along an active rail line to Devins Lane. 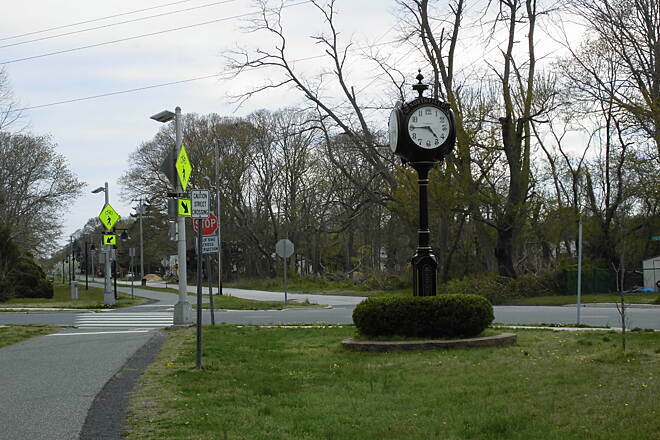 To reach Somers Point from US 322/40 (Black Horse Pike), take US 9/New Road South 2.2 miles. Turn left on West Mill Road. Turn right on Shore Road and go 4.3 miles. Turn right onto West New Jersey Avenue. Turn right onto 1st Avenue. Parking is on the right. 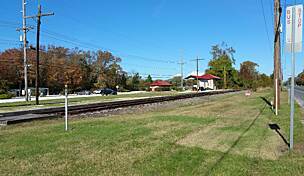 To reach Pleasantville, US 322/40 (Black Horse Pike) in town becomes West Verona Avenue. Turn right onto South Main Street. Proceed one block and turn right onto Decatur Avenue. There is limited curbside parking. Simple flat trail through pretty cities. 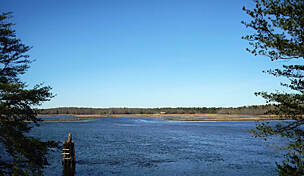 I started off at the VFW parking lot in Somers Point and rode down to the former rail bridge over the Black Horse Pike. This is a great trail for cruising and relaxing as well as meeting people. The main downside of this trail is the many cross streets. Local knowledge is useful here to know which streets you can simply stop and then roll on through and which streets you need to keep a very wary eye out for drivers (Central, Tilton, Mill, etc.) . Also, there are a few places where roots have made the path bumpy and places where the trail turns slightly while crossing major roads. Pleasantville can be not so pleasant at times, but it's fine in the daytime. 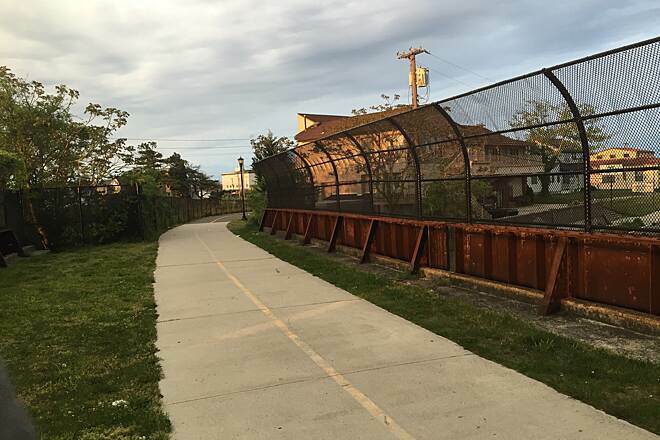 The other neat thing about this trail is that it connects to the 9th street bridge that takes you into Ocean City. There are a couple routes besides the one marked on the map that'll get you to the bridge without having to cross at the major intersection before the bridge. 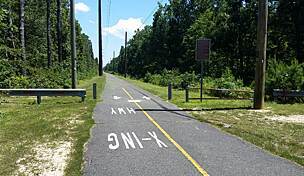 This is a wonderful bike path that connects four cities along Shore Road in Atlantic County. The path is well maintained and heavily used. Improvements are planned on both end of the path. 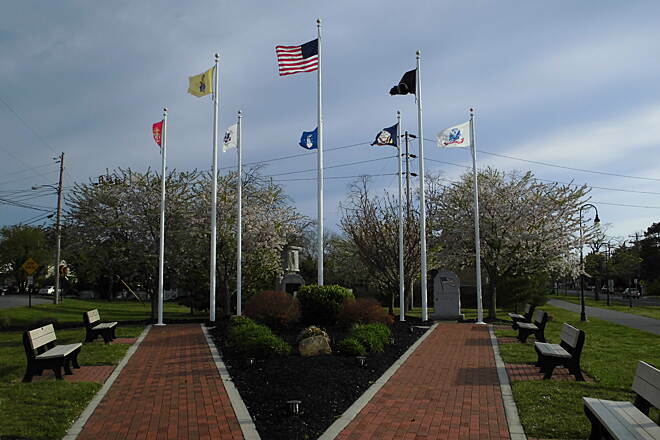 In Pleasantville, a State grant will fund the installation of LED lighting in areas that are currently not lit. 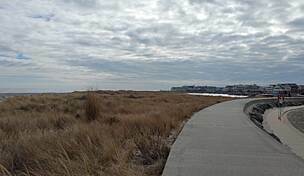 In Somers Point, grant funds will be used to complete the "missing link" a new section of the bike path that will connect it to the Route 52 Causeway into Ocean City. 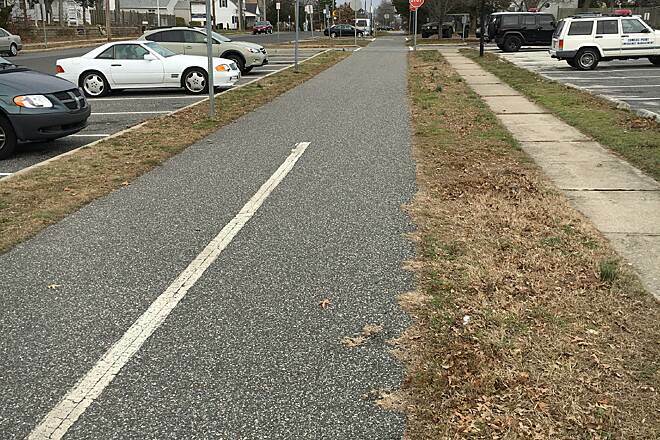 A grant will also the widening of the bike path in Somers Point to ten feet and the installation of new LED decorative lighting. Great Trail.. Nice scenic bike ride! This is a well used trail from stat to finish. If cross streets bother you this trail is not for you. I did this on an older Mt Bike with a cross tire and had a nice ride. I went from north to south and on my return in the after noon there were crossing guards at each street crossing as school kids use this trail to get back and forth from school. The high light of the ride is the old train station I think it is a rebuild but not sure. 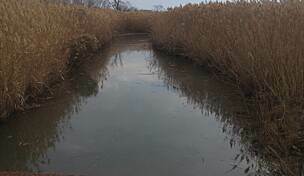 It was not the best day weather wise but the people of Pleasantville and Somers Point have one nice trail. At the South point you can ride down the hill and get over to Ocean City. The crossing is very busy but it has a great cross walk with a long light. This bike trail is right around the corner from where I live. I walk both ends several times a week. Great exercise! I love the Linwood Arboretum especially when the flowers are in full bloom and the park. Some of the intersections at both ends can be dangerous to cross especially because drivers don't know the rules stopping at the crosswalk with no pedestrians in the intersection. If I had a suggestion, it would be putting water fountains along the route and some portable toilets. Right now, the only water fountain is at the Linwood Arboretum and the only restroom is at Our Lady of Sorrows Church. Other than that, I love it. It's very well-maintained and clean. Did this trail as an out and back from on a Sunday afternoon. Parked in a public lot in Pleasantville - kind of a shady neighborhood but the public lot at corner of Green and Main had abundant parking. We found the trail and traveled south gingerly, not knowing what to expect after encountering some broken glass on the first couple hundred yards of the path. Neighborhoods and trail maintenance improved as we rode through Northfield and Linwood. As others have noted, there are many street crossings. We didn't see too many cars out and about on Sunday afternoon - everyone was at the beach! Not much shade cover on this route, but there are benches and parks nearly the entire length of trail. 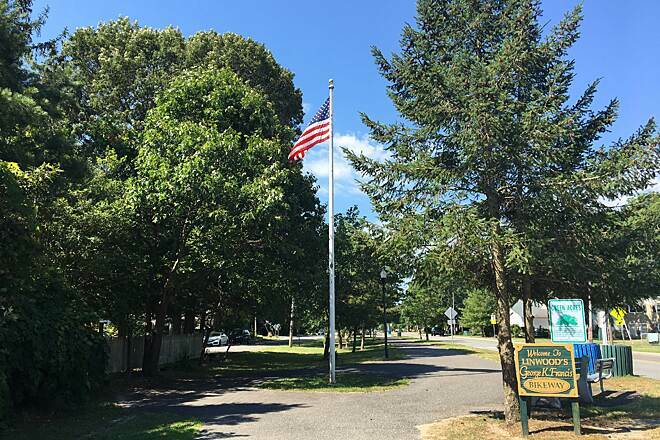 The trail generally passes through residential neighborhoods with limited food, we went a few blocks west to New Road (Rte 9) which has some quick food options. One more thing - we saw a trail leading due west from the start of the trail in Pleasantville. 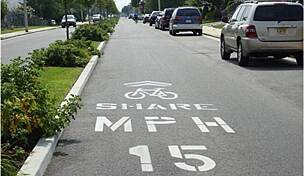 Does anyone know if this connects with the Atlantic City Bikeway? We didn't have time to explore - wanted to get out of Pleasantville before dusk! like other reviewers have commented, it's a rather dubious beginning @the pleasantville end. things quickly improve as you transition into northfield. next, linwood is downright nice. somers point resembled pleasantville, so it was time to turn around. it was near the end by then anyway. the surface is mostly smooth and there are plenty of park benches pathside if you need to take a break. far too many street crossings for my taste, however. you have to really stay alert and look both ways, just like mommy told ya when you were little. 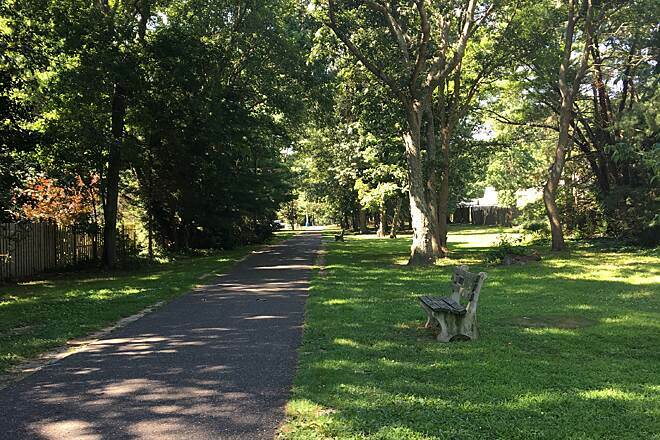 This is a beautiful trail that runs through Egg Harbor Township, NJ, and it reminded me of the New Jersey that I remember when my family would go "down the shore". Guys playing catch in the field... Little League games at the field in the distance... the smell of barbeques wafting everywhere (I rode on a Saturday afternoon)... This area is Bruce Springsteen's (or Bon Jovi's) New Jersey - not Snooki's. I started in Pleasantville, and I was dubious to park my car there. While everything was fine when I returned, I would have definitely parked my car further south (Northfield or Linwood). While I can't tell you what parking would be like in the height of summer, there was plenty of parking along the trail in mid-April. The trail is paved the entire way - and it's in pretty good shape. There were some bumps due to roots tunnelling under the asphalt, but the trail is fine for all sorts of bicycles. 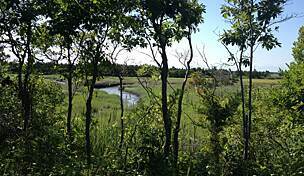 The trail runs through several well maintained parks and runs down to Somers Point. 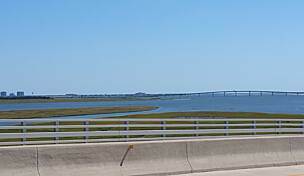 After taking a little run (~1/2 mile) on several lightly used roads, you can cross the Somers Point Bridge and head to the beach in Ocean City. As I started late in the day, I passed on that - maybe next time. The trail crosses a bunch of small residential streets, along with some heavily trafficked larger streets. 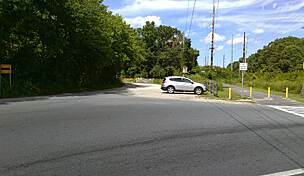 Pay attention at the crossings - because: 1) occasionally the trail crosses at strange angle, leaving a blind corner either for you or a crossing car, and 2) the cars definitely aren't paying attention. Because of this, I would not recommend this trail for smaller children. Additionally, I would not recommend this if you looking for a serious workout. But if you're looking for a flat, leisurely ride through a residential beach community - this is your trail. We biked from Ocean City to Linwood. We stopped for a rest and a cold drink at the Linwood Market and headed back. The trail was smooth, well maintained, and not crowded at all for a Saturday in the summer. There's several intersections that you must use caution, although most of the traffic was local and slowed down and waved us through. Very enjoyable! "The trail is a very enjoyable one, overall. The northern end goes through some marginal neighborhoods in Pleasantville, though. It's too bad the northern end of the trail has been closed off at the U.S. Route 40/322 former railway bridge. Navigating to the north side of the bridge through the neighborhoods, you can see the disused ""off ramp"" leading down from the bridge. The trail's name should be changed to honor the former trolley line that ran on the right of way, The Shore Fast Line. It connected Atlantic City and Ocean City until it ceased operation in the late 1940's. " I just completed this trail and can say that it's getting better and better (although there are many road crossings where caution is necessary). 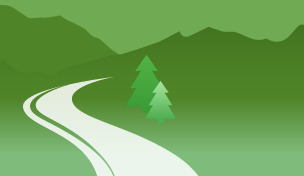 The trail has a good asphalt surface that is well maintained. The flat trail makes for a good family ride. There are also two good deli stops halfway.